Cool Year of the Tiger poster from Coca-Cola and Target found by Asianmommy. Flowers, food, candles, and incense are offered to a family's ancestors at the home's altar. It's an act of respect to honor and unite the family with those of the previous generations who've passed on. Letting the family elders eat first is considered a Chinese duty, and this applies to the dead as well as the living. Before sitting down to dinner, traditional families set a serving of the New Year's meal, including wine and tea, at the altar. It's a way of giving thanks, as the Chinese believe the family's good fortune is directly related to the well-being of its forebears. Once the dead ancestors have "eaten" their fill, the family isn't shy about consuming their leftovers, as being Chinese also means being practical. Never in my life we have ever done this at Chinese New Year. And that goes for all of my mom's 73 years as well. It must all go back to not really being Chinese. The closest passed ancestor was my dad. Seeing his picture on the altar brought back memories of his bitter end. My mother was telling me how his ghost was coming back to visit us to eat our food and take our money offerings. I immediately thought that he wouldn't want to come here, he would probably rather visit with his girlfriend and her daughter's family. Why would he want to see his only two blood grandchildren WHO HE LEFT NOTHING TO? Sorry, just demonstrating the state of my mind at the time. Paying respects went smoothly at first, and then all hell broke loose. Here's my mother's version of the story (slightly edited for clarity). I went to Rosie’s house for the New Year's Eve dinner on Saturday evening. 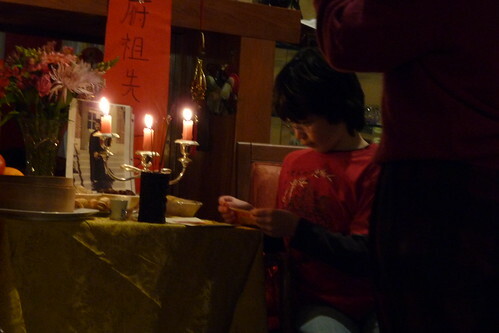 She made traditional Chinese rituals by inviting her ancestors (the deceased) to her house for New Year's Eve dinner. I wanted to do the same when my daughter, Angie, Doug, my son-in-law, and two grandchildren, Adam (9 years old) and Dova (6 years old) came back on New Year's Day. 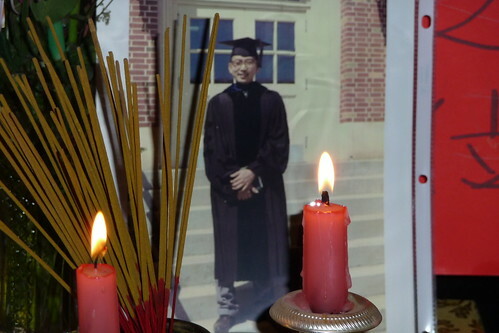 I set up a table in the living room in front of fireplace and placed my late husband John’s photo on the table. I searched all the albums for my and John’s parents photos, but in vain. So I wrote their names on two pieces (1 by 6 ft long) of red paper boards and hung them next to the table. The table was nicely arranged with a pair of red candles, incense jar and flowers. Foods and fruits were also displayed on the table. There were three glasses of wine on the table, one for heaven, one for earth and the other for people (the ancestors). After that, I was supposed to open the front door to invite the ghost ancestors to come inside the house for the feast. But something happened at that moment, Dova chipped her lips on the arm chair and she was bleeding a little. She was crying loudly and worrying that she was not able to eat anything anymore. In such chaotic moment, I forgot to open the door. Well, in my mind, I thought that they are a metaphor of spiritual ghosts, capable of going in and out of the house as they wish. So they were in the house already. The next step was for each family member to pay respect to the ancestors. We took turn to light up three incenses and doing prostration in front of the table as a gesture to pay our respect to them. I did it first. Angie made three bows instead. She felt a little awkward for the situation and also she was having some rashes from shingle virus infection. Adam was so excited to do the ritual without asking any silly question. 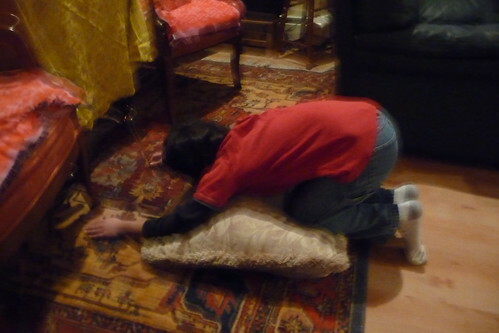 When it was his turn, he did prostration so well, kneeling down in front of table like doing the “child pose” in my meditation class, what a sweet boy!! 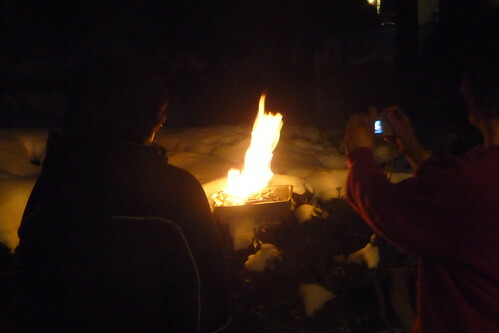 When all the incenses were burned out, we burned the paper “golden nuggets” in a jar outside the house. Burning the golden nuggets was made to send money to ancestors used in heaven. Actually, I forgot how to do the origami of “golden nuggets”. I folded few boats. Adam made whole bunch of airplanes. I hope it would be useful to the ghosts, ha! Ha!! In the end, Adam and I sprayed the wine on the burning paper and said goodbye his grandfather and many many great grandparents. Upon further reading in Good Luck Life , I learned that joss paper, imprinted with silver and gold stamps are supposed to be folded into ingot shapes so the paper will ignite and burn easily. When folded correctly (roll it into an empty tube similar to a coin wrapper, tuck in the bottom edges and leave the top edges pointing out), it looks like a boat-shaped gold ingot. Since I forgot how to make an origami boat, I suggested that we make paper airplanes. Of course Adam can't fold paper airplanes without throwing a few. By the time we were to pay respects. I did so reluctantly. I bowed three times, but refused to prostate on the floor and put my three incense sticks in the holder. When it was Adam's turn, he bowed deeply. And performed the prostration as if he was being graded. My mom and I were surprised that Adam completely embraced these rituals without question. We were giggling so much I couldn't even get a still photograph of him. He kept looking at us to see if he was doing anything wrong. We kept reassuring him though our giggles that he was doing it absolutely right, more correctly than we had done. He may be the most Chinese of us all. At this point, Dova was screaming because she nearly knocked a tooth out and her mouth was a bloody mess. I had to hold her for an hour before she calmed down. Doug went to another room because he didn't like the smoky incense. It was picture perfect. While the incense was burning, the ghosts were still eating. After the ancestor's feast (i.e. 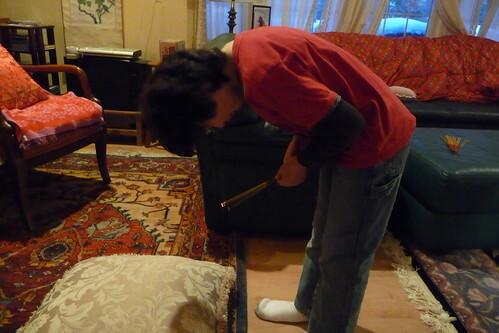 the incense burned out), Adam and grandma went outside to burn the money for the ancestors. We were definitely "practical" and ate the food afterward. I've always wondered about the Chinese New Year Celebration -- I would love to participate some day. I've also always wished I had been born in the Year of the Tiger. No such luck, I'm just a rat. Thank you for sharing this ritual with us I for one never really understood it. Thank you for sharing this! I know how much the ancestors are respected, but i have never seen or read about how this works. it seems like it was a nice evening, and that you have a special family. I've wondered about it, too, but never understood how it worked. It is so wonderful that you shared this custom with your children. I'm sure they loved every minute of it. 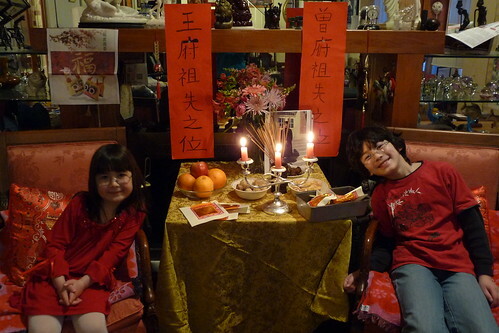 Every year, we host Chinese New Year play date with our friends. We have a potluck lunch and dragon parade. The kids make lanterns and everyone gets a red envelope with 3 coins in it. The children love it and look for to this play date every year. It's so important to teach our children about other cultures and embrace them all. Wow. That is so interesting that you never participated before. I love your pictures and how enthusiastically your children participated : ) So fun! There are so much more to tell in this Chinese ritual. The food we had for new year dinner including egg dumpling, the golden nuggets for the family, chicken, the legendary bird Phenix, fish, abundant in resouces and noodle, longevity. Thanks for the shout-out, Angela! 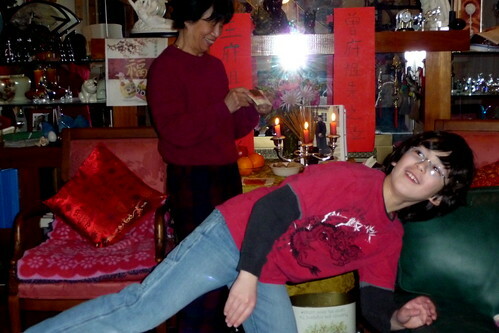 It's nice to hear how you and your family celebrated Chinese New Year. My family just went out to eat at a Chinese restaurant and gave out red envelopes to the kids.